Removing a wallpaper border with putty knife. So, you just bought the house of your dreams, you walk in and what do you see but the ugliest wallpaper border you have ever seen. While wallpaper borders can offer a quick and easy way to improve the beauty of any room, when the time comes to remove or redecorate, there are three methods you can use to remove the wallpaper border—heat, moisture or DIY wallpaper stripper method. This will be no easy task, but with a few good tips and elbow grease, the job will get done. Also, the removal will depend on the type of wallpaper used, the type of surface the wallpaper is glued on and the type of adhesive used. First, you will want to try using heat to remove wallpaper borders. The heat method can be done by two methods—hair dryer or a steamer. You will need to have a 1200 or 1500 watt hair dryer and a plastic scraper. Turn your hair dryer on its lowest high heat setting. 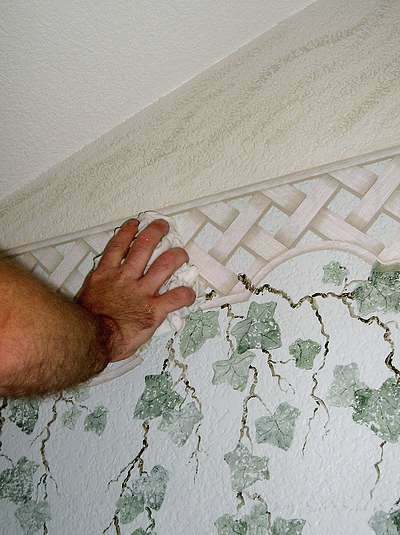 Hold the dryer approximately 10 inches from the surface of the wallpaper; allow the warm air to blow onto the surface. As the paper heats up the glue will begin to soften. Next, gently pull away the border. You can use the plastic scraper, if necessary to help loosen the bond. If you do not like the dryer method, you can use the steamer method. Take the steamer and work from the bottom to the top in small sections. Once the border begins to loosen, use the plastic scraper to remove the remaining border from the wall. Before you know it you will be ready to redecorate your walls. 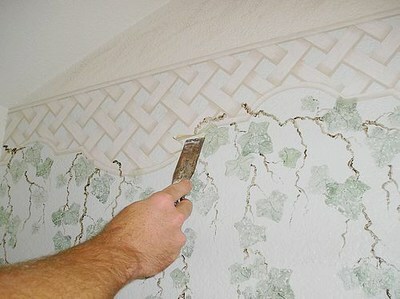 Another alternative is using moisture to remove the wallpaper. Items needed for this method include water, spray bottle (sponge or rag can also be used), plastic scraper and a perforation tool (optional). Fill the spray bottle with warm water, mist the surface of the wallpaper border and let the water soak into the border and soften the adhesive. Once the adhesive has softened begin peeling the border off the wall, the plastic scraper can be used if necessary. Apply more water as needed. If the border has a vinyl covering the water will not be able to penetrate the glue, in this case you will need to use the perforating tool and spray the surface with more water. The border will pull away in strips. Continue misting with warm water until you’ve removed all of the border. You are now ready to redecorate. Our last suggestion is the DIY wallpaper stripper method. There are a variety of commercial wallpaper strippers but a cheaper method is to use one of two recipes you can make at home. The first recipe is fabric softener wallpaper stripper. Combine one capful of fabric softener with four cups water. The second recipe is vinegar wallpaper stripper. Mix one part vinegar with one warm part water. If you have a stronger adhesive mix two parts vinegar with 1 part water. To remove wallpaper borders you will need to fill a spray bottle with either recipe, spray directly on the surface. Allow the mixture to soak into wallpaper completely. Then use a plastic scraper if necessary. Once the border is removed, you will need to wipe the surface with a damp cloth. A word of warning on using the vinegar mixture—it will leave a strong smell in the house for several days. There’s one great thing about these tips on how to remove wallpaper borders. There is no great expense. The tools you will need to get the project complete are most likely already in your home. Helpful article ! Thanks for sharing !! I love the wall mural designs you have show cased in your above post .